Just because it is now officially March, it is less than a month until spring starts on the calendar, and the retail stores have been trying to convince us for weeks that it is already time to buy tee shirts and sandals and flowing spring dresses, around these parts in Ontario we can’t stand down just yet. The temperatures are well below zero this week, I’m on my second cold since mid-January, and lordy oh lordy do I have sweater stash that needs knitting up. This was a big motivator for me in starting the Blooming Cardigan. It was a perfect gauge match for the Wild Apple Hill Farm wool I bought at Rhinebeck in 2008 (a rustic, wooly aran wool with heathery texture), and I thought it would just be a nice way to knock out a sweater. I liked the style but didn’t anticipate loving it the same way I have known and loved other sweaters. Well, I’m here to tell you I was wrong. I do love this sweater. I might wear it all week, in fact. Needles: 5mm for the body and sleeves, 3.75mm for the ribbing and collar. If I did it again I’d go up to 4.0mm on the ribbing. The other main modification I did was to change the little cable twists at the edge of the bobbled nosegay pattern, so that they were twisting in opposite directions instead of the same direction. I also moved the nosegay pattern towards the center a little bit, so that I could keep it intact after doing the armhole shaping decreases. Other than that, I did work the body in one piece, and eliminated the sash purely for personal preference, but the pattern itself is well written and suitable for a variety of skill levels. If you’ve got something aran and tweedy or heathery sitting around, give this a whirl. This took me about a month and a half start to finish, but if I”d dedicated myself to it more monogamously it would have been finished in a few weeks. I have to start knitting at 16 sts over 4 ins more often. I have to say that the more I spend time looking at this Winter 2008 issue of Interweave Knits, the more I like it. In fact, there isn’t much I wouldn’t knit from this issue, and there aren’t many magazine issues I can say that about. I think this issue has been getting less love among knitters because whenever I hear people talking about the new Spring 2009 issue, it is often with a “thank goodness it’s better than the last issue” tacked on in passing. Well, Winter 2008 IK, I’m here for you. Let’s be friends and knit things together, we’ll have a grand old time. Simply elegant! I wish I had your talent and could create such a beautiful masterpiece in such a wonderful color! Gorgeous! You did a really good job. Absolutely beautiful! You think that 1 1/2 month is long for a sweater??? Hi, hi, hi… not me! Congratulations! Really great. Both the yarn and the sweater. Very nice. It looks like a great fit too. I think you’ll have lots of winter left to wear it yet! Wow, it looks fabulous!! All the stars aligned for this cardi!! Our Autumn starts today, our seasons overlap the calendar year, though there’s always the debate about the solstice and equinox!!! That yarn is stunning, and the colour is fabulous on you. Well done! So cozy and cute! I love the details, and the blackberry is a gorgeous shade. Yep, it’s still warm wool sweater time here in Chicago, too. Very pretty. It also very flattering on you. I find that the more people dislike an issue, the more I like it. I don’t care for a lot of the trendy knits and I’m not much for accessories so when there are “classic” type sweaters I’m all over it. That’s usually when the folks don’t seem to like them anymore. That sweater looks great on you! It’s a wonderful color. I really liked the Winter issue, too. So many pretty sweaters! 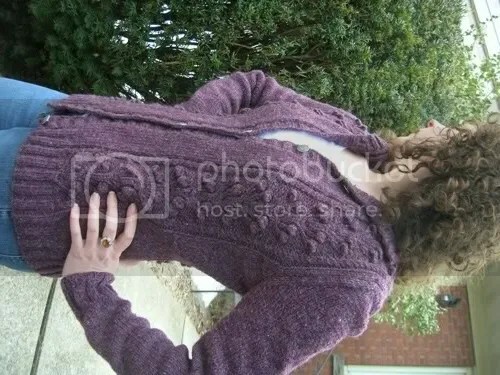 GORgeous sweater, beautifully knit, and you look ever so fetching in it (=great fit!). Just beautiful – and the colour is luscious! This is a stunning sweater, and it fits you perfectly. Well done! It’s gorgeous and really suits you. I can see why it’s grown on you!! I’m with you on the Interweave Winter 2008 issue. I love it! It looks fantastic. I am a sucker for purple anyway, but I love the color. Your mods sure made for a fantastic fit too! It’s beautiful on you! Truly a perfect fit. I thought that issue was pretty good too – not quite bowled over – but a solid issue. I love it!! The colour is incredible. Great job!!! 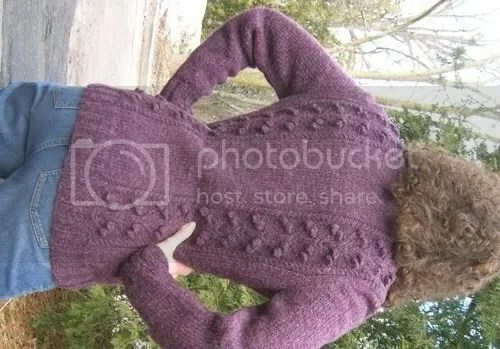 Fantastic, Glenna, a beautiful knit, and , if I may say, you have a lovely slim body to model it (not that I’m jealous or anything, cough…). I hope the temperature stays low enough for you to wear it for a while! Okay that knit is gorgeous and the explanation of your mods very helpful. The yarn”s fabulousness is even evident on my screen. I’m off to dig out IK Winter ’08 and reconsider the potential therein! Very beautiful! It looks much nicer than the cardigan in the IK winter 2008. How much positive ease do you have? I find it always difficult to decide how much ease I should choose. Gorgeous & it fits you so perfectly. Love the color & the texture of the yarn. Beautiful work & I am not surprise that you want to wear it all the time – I would too. Beautiful and it looks great on you. Well done! I also really love that issue of IK and it’s the only one I’ve ever bought at full price (though I am looking with longing at the summer issue coming up and possibly the last spring issue). That particular sweater intrigued me on my first couple of glances through the mag, but the more I looked, the less I liked. I LOVE your version of it though, and it might even be enough to consider keeping it on my queue. Also, that’s a great color. Your sweater is beautiful and the fit is truly awesome! 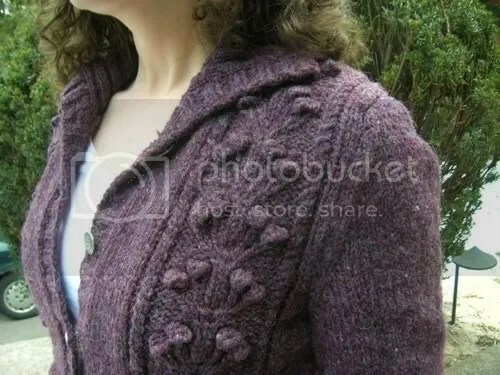 I’m about to start a sweater that appears on the front of the book, Continuous Cables, and I know that it will take me at least three times as long to make as it took you to make this sweater.